This acts as an appetizer during father's day dinner. 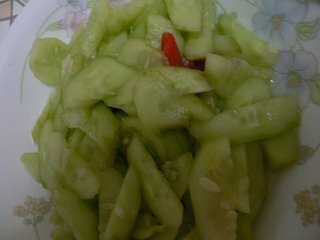 Mama bought many chinese cucumbers & sliced them, asking me what to do with it. I cracked my brain & came up with this. 1. In a big bowl, pour in all ingredients & mix well. Serve chilled.